Who were the first African American astronauts in outer space? Dr. Guion “Guy” Bluford, Jr. (1942–) achieved the rank of colonel in the U.S. Air Force as a fighter pilot and earned his Ph.D. in aerospace engineering in 1978. He joined NASA’s astronaut corps soon after, and on August 30, 1983, he became the first African American man in space when he served as a mission specialist on the space shuttle Challenger. Bluford then made three more shuttle flights, in October 1985, April 1991, and December 1992. Dr. Mae Carol Jemison (1956–) earned her M.D. in 1981 from Cornell Medical School in New York. After studying and working in Cuba, Kenya, and a Cambodian refugee camp in Thailand, and serving as a Peace Corps volunteer practicing medicine for two years in Sierra Leone and Liberia, she was accepted into the astronaut corps in 1987. On September 12, 1992, as a member of the crew of the space shuttle Endeavour, Jemison became the first African American woman in outer space. 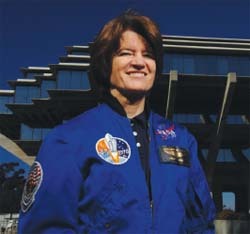 Dr. Sally Ride was the first American female astronaut to go into space, but two Soviet cosmonauts, Valentina Tereshkova and Svetlana Savitskaya, were the first women.